The TPA automates the processes of plan administration - minimizing errors and labor costs. The TPA is a central clearing point that will streamline and fully automate the flow of data and money between your company, your insurance carriers and other authorized parties. It's designed for employers who want to consolidate data for all group insurance plans in a central database for accounting, enrollment and eligibility reporting purposes. The TPA can handle any group benefit including voluntary programs. Create any number of Event Codes to trigger actions based on the participants current situation. From information packages and enrollment forms to new hires through life change confirmations and a forms library, the TPA is flexible enough to meet your requirements. It's event code driven, allowing you to attach a whole set of correspondence, letters and rule based actions to occur when the event code is assigned to a participant. The TPA is installed on your server, eliminating per person and monthly fees charged by ASP vendors - your data is always under your control. 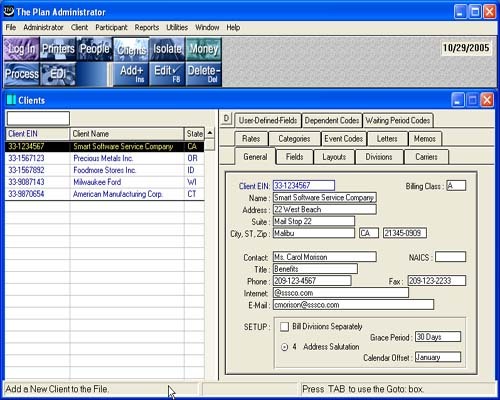 The TPA is completely integrated with all other EAS suite applications, including EASWeb. Set up scripts to automatically import data, process it - then output consolidated billings and carrier eligibility - all electronically. For A Free Demo Click On The Link Above Or Call 800.523.8047.